Use Jupiter to find the faint planet Neptune. This is the view on July 12 at 3 a.m. EDT. They scene is almost the same at that time of morning any day this week or next. Thus wrote John Keats, referring to William Herschel's discovery of the planet Uranus a few years before in 1781. Measurements of the position of Uranus soon showed that it was under the gravitational influence of another planet, farther out in the solar system. Predictions of the position of this new planet were made by John Couch Adams in 1843 and Urbain Le Verrier in 1845-1846, but both mathematicians had great difficulty in persuading any astronomer to actually look for the planet. Finally on September 23, 1846, a German astronomer, Johann Gottfried Galle, used Le Verrier's chart to actually locate and observe Neptune. This led to a major controversy as to which country should be credited with the discovery; ultimately the honor was shared. Ironically, Galle was not the first person to observe Neptune. It was actually observed twice by Galileo in 1612 and 1613, but he mistook it for a fixed star. At the time Galileo made this observation, Neptune was in conjunction with the planet Jupiter, meaning that both planets appeared very close together in the sky. The brightness of objects in the sky is measured by a system of magnitudes, a scale on which the brightest stars are described as 1st magnitude and the faintest stars visible to the naked eye as 6th magnitude. It is thus an inverse scale: the fainter an object, the larger its numerical magnitude. Neptune is an 8th-magnitude object, two magnitudes fainter than the faintest stars visible to the naked eye, so a small binocular or telescope is needed to make it visible. Normally finding Neptune amongst the stars is like finding the proverbial needle in a haystack. It requires detailed star charts and a great deal of patience. However, this week Jupiter will do all the hard work for you, and will make it really easy to spot Neptune. You will still need a binocular or small telescope to see Neptune, but the finding process will be easy. Look at the map accompanying this article. It shows the view on the morning of July 12, but the positions of the planets won't change a lot all week. 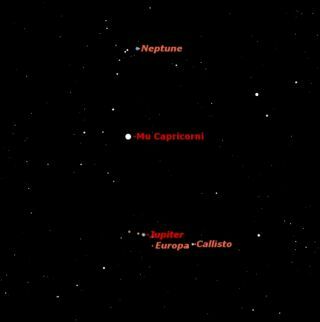 Both planets are moving from left to right relative to Mu Capricorni, Jupiter a lot faster than Neptune. Neptune will be the only bright object (other than Mu Capricorni) just to the north of Jupiter for the next week. You can find it any night this week. Start with Jupiter, at 3 a.m. by far the brightest object in the southern sky. Venus is brighter, but it hasn't risen yet. With a binocular or small telescope you will see Jupiter with its accompanying Galilean moons. Sweep slightly upward in the sky, and you'll see the fifth magnitude star Mu Capricorni. Sweep a little further upward, and there will be the planet Neptune, quite a bit fainter than Mu Capricorni. Because Neptune is so far away, it will appear star-like in all but the largest telescopes, but will stand out because of its odd blue-green color, quite different than any star. Congratulations…you have now duplicated Galileo's observations of 1612 and 1613, and have seen a planet that most amateur astronomers seldom if ever see.